Improbable as it is for snow to fall during August, history tells of a snowfall that seemed more impossible, namely in Rome, Italy. August 5, 352, snow fell during the night in Rome. There lived in the Eternal City a nobleman, John and his childless wife, who had been blessed with much of this world’s goods. 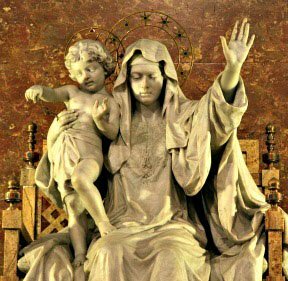 They chose the Mother of God as the heir to their fortune, and at the suggestion of Pope Liberius, prayed that she might make known to them how to do this by a particular sign. 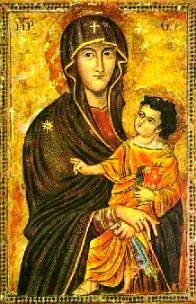 In answer, the Virgin Mother during the night of August 5, appeared to John and his wife and also to the Holy Father, Pope Liberius, directing them to build a church in her honor on the crown of the Esquiline Hill. And what would be the sign that John and his wife had requested? Snow rarely falls in Rome, but the flakes fell silently during that night, blanketing the peak of the historic hill. In the morning the news quickly spread and crowds gathered to throng up the hill and behold the white splendor. The snow had fallen in a particular pattern, showing the outline of the future church. When it became known that the snow was a sign from Mary, the people spontaneously added another to her long list of titles, Our Lady of the Snows. The church built there is now known as Saint Mary Major. It is the focal point of devotion for many of Mary’s millions of children, one of the most popular churches in the world. 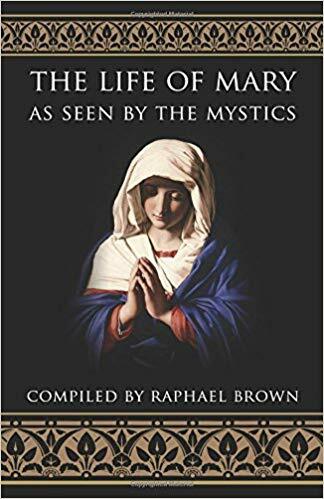 There Mary has been pleased to secure various and many blessings as numerous and varied, as the flakes of snow that fell that August night. The church built by John and his wife in honor of Our Lady of the Snows, restored and enlarged at various times was known by different names: the Basilica of Liberius, Saint Mary of the Crib because it enshrines relics of Christ’s Crib; lastly, Saint Mary Major, to distinguish it from the many other Roman churches dedicated to the Mother of God; Major, means Greater. There is an image revered as Our Lady of the Snows, which is believed to have been produced by St. Luke the Apostle. Saint Mary Major is one of the four basilicas in which the pilgrims to Rome must pray in order to gain the indulgences of the Holy Year. Most fitting do we call Mary Our Lady of the Snows. The white blanket of that August night symbolizes Mary, pure as the driven snow; her blessings and graces, numerous and varied as the falling snowflakes. Science tells us that every snowflake is different in form and make-up: size, outline, structure, ornamentation, are all without limit, infinite in wondrous beauty, startling complexity, perfect symmetry as they fleet, dancing down from the sky. What a wonderful figure of the blessings Mary obtains for us! Snow changes the face of the earth, painting even a field of mud with a white coat. The grace of God won through prayer to Mary, also changes the face of the earth. Snow preserves the heat of the earth, protects vegetation, supplies moisture with slow effectiveness. Grace serves similar purposes: it preserves the warmth of God’s love in our hearts; it protects the soul from the chill of temptation and sin; it nourishes the soul with new life. We see a further symbolism in this feast. There are millions living in lands of ice and snow who have not come to the knowledge of Mary and her Divine Son. We might ask that with the actual snowflakes, she shower down upon them the graces of the True Faith.